About a year ago, I had a party for a home party plan company called Jewel Kade. With my show, I used my free spending and hostess credits to get a cool necklace just available to hostesses, and a holiday charm that said something about 'Santa stop here.' I loved it and wore it a lot between the time I received it and the end of the holiday season. A friend of mine was planning to have a party after the first of the year and I figured I'd get another charm then. Unfortunately, the show wasn't at the top of my friend's priority list (not that I would expect it to be! ), and the consultant never called my friend to follow-up! In conversation, my friend said she would book a show, but she didn't feel like looking up the consultant's information. Totally fair, and I don't know that I'd want to keep working with someone who didn't follow up when they said they would. I called the consultant about her order with my company, and she asked if my friend wanted to have a party. I told her I didn't know why she wouldn't, and suggest she call my friend. But she never did. That gets us around to the point that I still only have a holiday charm for my necklace! I'm too busy now to have another show, but I'd love to receive the charm pictured to go with my necklace year round. On their website, it's called the 'American Heart Association Glitter Charm.' It looks like you can order straight through their site without contacting a consultant. Bad news for consultants who don't follow up with potential hostesses and customers, but good news for me! Hear that, Santa? 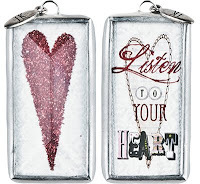 I'd love to receive the 'American Heart Association Glitter Charm' from Jewel Kade.